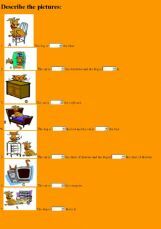 Choose the correct preposition to describe the picture. 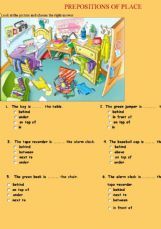 This material is designed to be either a test or an exercise to revise prepositions. 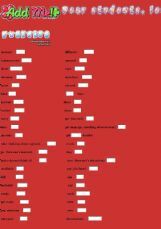 It is the round up of my contributed wss on dependant prepositions. 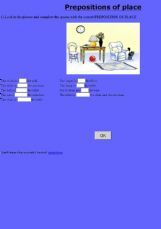 The ss will be able to see the true situation whether they know prepositions or should revise them. 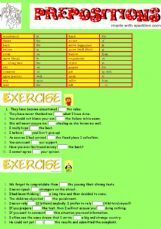 I�VE TAKEN THIS EXERCISE FROM ONE OF MY WORSHEETS.I THINK IT WILL BE EASIER FOR MY STUDENTS IF THEY PRACTICE ONLINE. 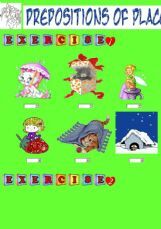 4 exercises to teach prepositions. 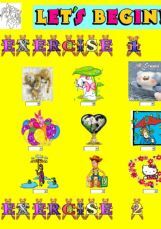 2 exercises suitable for very young learners with assistance and guideness of a parent or a teacher. 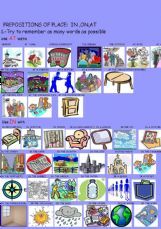 2 exercises prepositions of place (in, on, under) suitable for very young learners too. 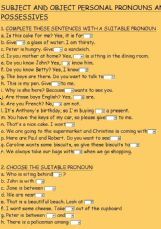 Great way for your begginers to learn how and when t use each preposition of place.